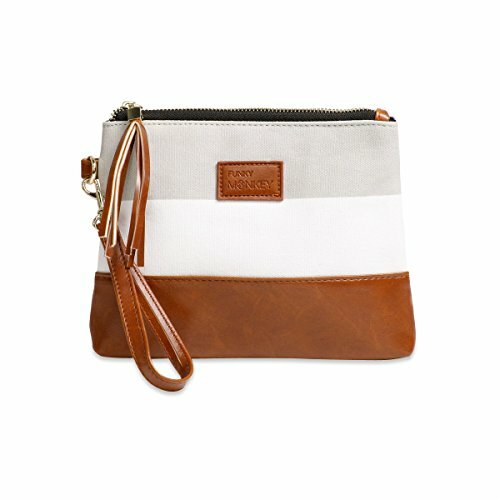 Madi Wristlet Collection: Gray/White Stripe & Brown Vegan Leather Bottom This zippered clutch is a beautifully coordinated faux leather bottom with a coordinating tweed fabric top. Each is fully lined with a black fabric. Each also has a removable wrist strap with antique brass hardware, allowing you to secure around your wrist or tuck in a larger tote. The small size is a great way to carry all your cards, cash, and lipsticks for those on the go moments in life! The medium and Large size works great as a "hold all" wristlet from your phone to cards and must have everyday items! Carry inside a larger tote for easy access.